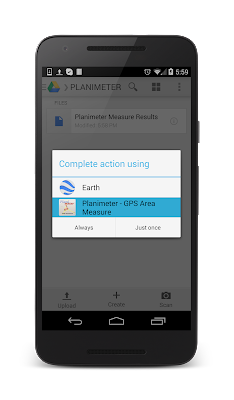 VisTech.Projects: [Android] Planimeter fix: share and open KML files directly from Google Drive. [Android] Planimeter fix: share and open KML files directly from Google Drive. Android version of Planimeter has been updated to v4.5.3 with a KML sharing fix. Now KML files, shared from Planimeter via Google Drive, can be opened directly from the Drive. Also in the mobile version of Google Earth you can use Google Drive option to open synced files. Still missing to Import kml Files. Eg: often, I'm drawing Single Objects, then I want to combine them. Thanks for the comment. We understand you want to be able to upload KML file to the app when you have already something measured there - multiple areas. Correct? Não há nada disponível no mercado comparável ao planímeter, NADA!